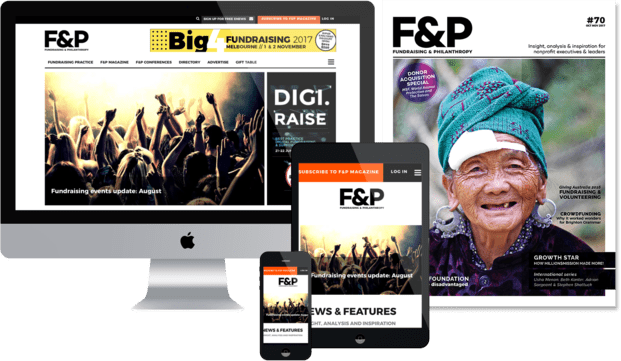 F&P readers are nonprofit managers and executives working in fundraising, marketing, communications and leadership roles. They include heads of fundraising, direct marketing managers, CEOs, board members, directors of development, philanthropists, and administrators of trusts and foundations. They are decision makers responsible for purchasing a wide variety of services and products. 8,180 recipients have subscribed for e-Newsletter. Approximately 1,100 fundraising managers and executives attend our five F&P conferences each year. Since its inception in 2004, F&P has been the leading publication covering fundraising in Australasia. Regular content includes fundraising case studies, analysis and opinion, the latest industry trends, profiles on leading fundraising executives and organisations, and much more. The magazine is published every two months. The F&P website is a digital hub for the fundraising profession. News, in-depth articles, directories, a training calendar, the latest big donations and more can all be found here. Combined with our twice-monthly enewsletters, companies can connect with our readers through banner and text ads, sponsorship, lead generation, partner content, special offers, news and business updates. Via published articles, blogs, case studies and news items, we provide a variety of print and digital channels for you to tell your story, showcase your expertise and engage with our readers in a way that adds value to their knowledge and skills. Content marketing helps readers understand the services you provide and the benefits of using them. F&P can be the vehicle through which you build a trusted relationship with a highly relevant and targeted audience. With four conferences per year, we provide the environment for exhibitors and sponsors to have a presence amongst fundraising executives and decision-makers. Live events such as these provide a great way to connect in-person with your prospective clients. EventRaise: This conference focuses on how charity and nonprofit organisations can improve and enhance their fundraising events. Digi.Raise: As the name implies, this professional development event is all about digital fundraising and supporter engagement. Fundraising Forum: The Forum has a direct marketing focus with the key themes being donor acquisition, donor retention, integrated campaigns and strategy. Fundraising leaders and senior management are the core delegate group. Big4Fundraising: Alternating between Sydney and Melbourne, this event covers the big four of fundraising: major gifts, corporate partnerships, bequests, and trusts and foundations. Generosity Forum: This Forum provides inspiration and insight for the philanthropic community. The event attracts an audience of major donors and philanthropists, financial advisors, members of collective giving groups and community foundations, administrators of trusts/foundations, impact investors and social entrepreneurs. You are welcome to give us a call to discuss your needs further.